A true case of the whole being more than the sum of its parts, Thug Life is more than just the ingredients in it. True, the combination of smooth blond tobacco with hints of vanilla, caramel and nuts make for an absolutely divine vape, but Thug life goes way beyond of being just a fantastic tasting liquid. Chemically engineered within precise parameters, Thug Life offers one of the very best performances you will ever experience - and yes, we do realize what a heavy statement that is, but it's the truth. A signature blend with all the qualities of top flight liquids, Thug Life is made with extracts from sun-cured tobacco, a process that increases aromatic compounds and makes the tobacco lighter. A medium-strength blend, Thug Life delivers extremely dense clouds just bursting with flavor, it's ridiculously aromatic! As you inhale, you get a caramel and vanilla infused tobacco taste laced with a hint of nuts that feels like a million dollars and more. As good as the inhale is, the litmus test is always the exhale. When you exhale, you automatically close your eyes in appreciation and savor the feeling till the last possible moment. Not many liquids can do that, which is why we say Thug Life offers one of the very best performances you will ever experience. 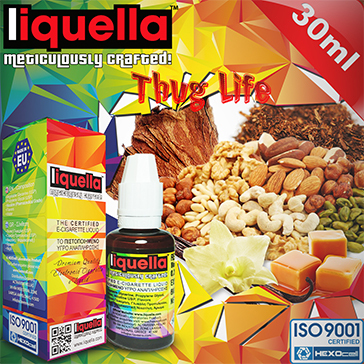 European Product / EP & USP Compliant Liquella liquids are ISO 9001 quality certified and made using only the finest flavors and pharmaceutical grade nicotine. → Please click here to view our exceptionally smooth tobacco blends or here for our delicious fruity and exotic blends.